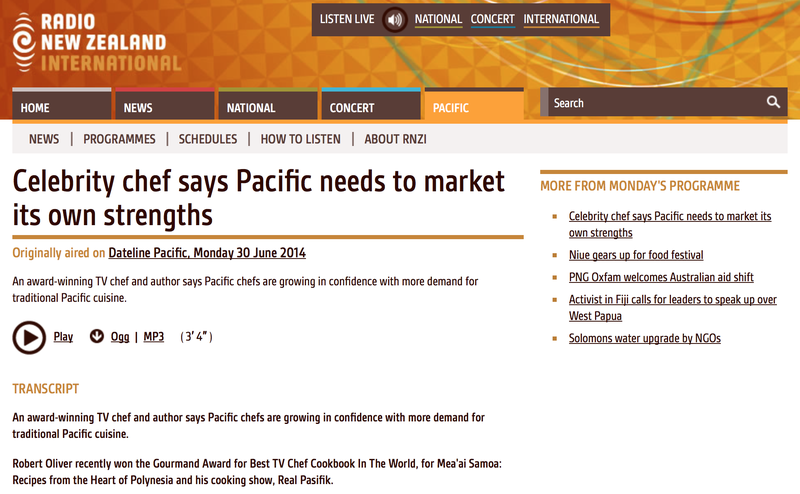 An award-winning TV chef and author says Pacific chefs are growing in confidence with more demand for traditional Pacific cuisine. Robert Oliver recently won the Gourmand Award for Best TV Chef Cookbook In The World, for Mea’ai Samoa: Recipes from the Heart of Polynesia and his cooking show, Real Pasifik. He told Alex Perrottet that unfortunately the Pacific can be known for cheap fatty foods imported into the region, but unique organic foods are becoming more and more popular. ROBERT OLIVER: I would encourage the chefs to get back into the basic Pacific basket, there’s a lot more than people know about. In Fiji there’s ota, there’s riverfern, they eat kaluku, which is a bush fern in Niue. There’s incredible greens, I think that’s what people don’t realise. They think of the taro and the rootcrops in the Pacific, in terms of Pacific agriculture because that’s what we get from the Pacific and there’s this mindset that that’s their whole toolkit of cuisine but there’s a huge unbelievable range of foods in the Pacific. ALEX PERROTTET: Everyone talks about Pacific health, there’s non communicable diseases, and then you’re saying so much of the traditional food is so healthy. What sort of mentality needs to change then in order to, how do we attack that problem, with as you say, what’s readily available agriculturally in the country? RO: Well that’s why I work in putting the prestige back into the local cuisine partly, but it’s also education. Remember for years we thought margarine was more healthy because it was marketed as such. Well all the instant noodles companies and all the convenience foods market themselves as being healthy and for a public that’s maybe not used to the kind of advertorial avalanche that we’re a bit more used to in the larger countries, it’s hard to discern what’s information and what’s PR. I was filming in a village in Fiji last week and they cooked me the most beautiful food and it was from the stream, river prawns from the river and watercress from the stream and it was beautiful food, it was really oat Fijian cuisine from the village, which, people think of village food as being very rough, but not at all. And it made me sad, even though I loved the food, because I thought the greater Fijian community has been deluged with marketing that little Pacific countries can’t even match the marketing budgets of those, their whole economies are not even as big as some of those marketing companies. So a different approach, and I think what’s a different approach, for me, it’s about working with the media and that’s why television is so important to me and developing this community that feels the health, the health and wealth of these products. AP: Why with the Pacific culture here, don’t we have Pacific restaurants and tell me about this Kai Pasifika idea and what’s the latest? RO: Well that’s, we’re just getting that together now, I don’t have any particular dates yet but it’s a project that’s burning in my belly. Yeah it does seem like a terrific initiative but don’t worry because I’m going to get on with it.